Portugal/ Beja Municipal Airfield (LPBE) – A Rans S-6S Coyote II XL plane (CS-UJF) crashed and was destroyed by subsequent fire. The pilot, a 66 old male, was injured. The passenger was not injured. Uganda/ Mpigi district/ Kamengo Sub County – A Cessna U206F Stationair (5X-WTA) flipped over while landing in a corn field. No injuries. US/ AZ/ Yuma/ Near the Gila River – A Cessna 140 (N2841N) flipped over upon takeoff. Both occupants, a male pilot and a female passenger, sustained minor injuries. US/ KY/ Buckberry Trail, Suwannee – A Piper PA-34-200T Seneca II (N81291) impacted the wooded terrain about 10 miles short of the airport. Four of the five occupants onboard were fatally injured. One 7 year old occupant onboard the aircraft received injuries but walked to a nearby house to raise the alarm. UK/ Stornoway Airport (SYY) – Flybe Saab 340B plane (G-LGNL) suffered a runway excursion upon takeoff. Its nose gear collapsed. Two passengers suffered minor injuries. Puerto Rico/ San Juan – A Robinson R44 Raven/Clipper II helicopter (N3183T) crashed. No injuries. Brazil/ MS/ Rodovia MS-141 – Ivinhema – A Cessna 210L Centurion II (PR-RCZ) made an emergency landing. Australia/ VIC/ Chesney Vale – A Schempp-Hirth Nimbus 2 glider (VH-GOV) crashed killing the pilot. Russia/ Magadan-Sokol Airport (GDX) – An Antonov 26B plane (RA-26082) skidded off the runway onto snow covered terrain during takeoff. The right hand main gear collapsed, causing the right hand wing to contact the ground. Venezuela/ Merida State/ El Tisure moor of Parque Sierra Nevada - Human remains of 1 person as well as cocaine were found together with debris of a plane. Argentina/ SF/ Aeroclub Rosario – A training Cessna 152-II plane (LV-OOG) crashed on landing. US/ CA/ Fresno/ near Fresno Chandler Executive Airport (KFCH) – A Cessna 172D Skyhawk (N2948U) clipped power lines and impacted terrain during a force landing due to an engine failure. No injuries. Portugal/ Tomar/ Valdonas flying field – A Tecnam P92 Echo Super (CS-UPH) crashed on the threshold of the runway. Both occupants were injured. Later the pilot died due to his injuries. US/ FL/ Key West/ Key West International Airport (KEYW) – A Cessna P206 (N2534X) experienced a loss of engine power and force landed to shoreline terrain short of the runway. One of the six occupants received minor injuries. UK/ Hampshire/ Basingstoke/ Blackwood Forest/ near A303 close to Popham Airfield – An Alpi Pioneer 400 (G-CGVO) impacted woodland terrain killing 2 occupants, injuring a boy onboard. US/ TX/ Port Arthur/ Beaumont/ Jack Brooks Regional Airport (KBPT) – A Piper PA-46-310P Malibu Mirage (N20DP) made a belly landing. No injuries. US/ CA/ San Luis Obispo/ San Luis Obispo County Regional Airport (KSBP) – A Waco YMF-F5C biplane (N171L) flipped over upon landing. No injuries. Brazil/ Parana/ Toledo – An EDRA Super Petrel LS ultra light aircraft (PU-PEK) impacted a soy bean field, causing the death of the pilot. Kenya/ Nairobi-Jomo Kenyatta International Airport (NBO/HKJK) – A Fokker 50 cargo plane (5Y-SIB) made a belly landing. No injuries. US/ TX/ Beaumont/ Port Arthur/ Jack Brooks Regional Airport (KBPT) – A Mooney M20K 231 (N1152L) experienced a collapse of the landing gear upon landing. No injuries. US/ CA/ Angwin/ Angwin Airport-Parrett Field (2O3) – A Beech 36-A33 Debonair (N907Q) experienced a runway overrun and subsequent impact with a boundary fence upon landing. No injuries. US/ AZ/ Sedona/ Sedona Airport (KSEZ) – A Piper PA-28R-200 Arrow (N3811M) experienced a runway excursion and subsequent landing gear collapse upon landing. No injuries. US/ IN/ Muncie/ SE of Delaware County Regional Airport (KMIE) – A Raytheon (Beech) A36 Bonanza plane (N349EA) impacted terrain during a missed approach. The pilot received minor injuries. Germany/ Dortmund Airport (DTM/EDLW) – A Cessna T210N Centurion (D-EKSL) failed to extend or collapsed the main gear upon landing. US/ MI/ Marquette/ Sawyer International Airport (KSAW) – A Cessna 172M Skyhawk (N6591H) experienced a loss of directional control and subsequent runway excursion upon landing. The airplane came to rest inverted sustaining substantial damage. No injuries. US/ CO/ south of Glade Park/ Johnson Creek area – An AutoGyro Calidus gyrocopter (N50NE) impacted remote terrain injuring both occupants, one of them seriously. Croatia/ Radosic near Sinj – An I.C.A. Brasov IS-28B2 glider (9A-GST) crashed due to a loss of altitude. Both occupants escaped without injuries. US/ TX/ Llano/ Llano Municipal Airport (KAQO) – A Cessna 195B Businessliner (N2125C) experienced a loss of power shortly after takeoff and impacted airport terrain. The airplane came to rest inverted. US/ NC/ Hickory/ near Hickory Regional Airport (KHKY) – A Beechcraft V35B Bonanza (N246JT) impacted wooded terrain shortly after takeoff injuring seriously the pilot. The 3 passengers received minor injuries. US/ VA/ Norfolk/ near Hampton Roads Executive Airport (KPVG) – A training Cessna 172S Skyhawk (N2102P) force landed to swamp terrain. The passenger onboard received minor injuries. New Zealand/ central North Island/ Lake Taupo/ Rotongaio Bay – A Pacific Aerospace 750XL plane (ZK-SDT) developed an engine problem while it was climbing over Lake Taupo. All 13 occupants on board made an emergency bale out. The wreckage is submerged in the lake. US/ OH/ Wright-Patterson Air Force Base - A McDonnell Douglas C-17A Globemaster III belonged to United States Air Force, 445th Airlift Wing, caught fire when the engines were started. US/ OR/ Portland International Airport (PDX/KPDX) – A cargo Boeing 757-222PCF (N531UA) was struck by at least five northern pintail ducks during initial climb. One of the engines lost power, forcing the crew to make an emergency landing. Brazil/ SP/ Congonhas Airport - Sao Paulo (CGH) – A Pilatus PC-12, a Beechcraft King Air 200, a Bombardier BD-100-1A10 Challenger 300 (PR-YOU) and several other smaller planes were damaged or destroyed when a hangar roof partially collapsed due to heavy rain fall. Russia/ Tula Oblast/ Sonino Airfield - Ten aircrafts were destroyed or substantially damaged in a hangar fire. Aircrafts included are: Yakovlev Ya-52 (RA-0454G), Cessna 150 (RA-2196G), ICP Savannah, MDM-1 Fox, YAK-55, SU-29, Van's RV-7, Van's RV-7 and etc. Mexico/ Juarez – A Eurocopter EC 130B4 (XA-SMG) crashed killing 2, injuring 3 occupants onboard. Ecuador/ Guayas/ Lorenzo de Garaycoa – A crop duster crashed killing the pilot. Kenya/ Kieni constituency/ Gathiuru area/ Mount Kenya forest - British Army Air Corps (AAC) Bell 212 helicopter (ZK067) made a force landing. Four British servicemen, three men and a woman were injured in the crash. South Africa/ Limpopo/ near Hoedspruit Aerodrome – A microlight plane (ZU-WCC) at a farm. Both occupants died in the crash. US/ MO/ Sullivan/ Sullivan Regional Airport (KUUV) - A Cessna 210B Centurion (N9565X) experienced a collapse of the main landing gear during an emergency landing. No injuries. US/ CA/ Van Nuys/ SW of Van Nuys Airport (KVNY) - A Lancair 320 (N7ZL) impacted roadway terrain shortly after takeoff killing the pilot. US/ ME/ Oxford/ Oxford County Regional Airport (81B) – A Cessna A185E Skywagon (N70037) struck two parked aircraft during taxi. The airplane sustained substantial damage. No injuries. US/ UT/ Great Salt Lake/ Eardley Spit – A Cirrus SR22 plane (N383GM) crashed into the lake. The pilot of the plane died in the crash. Guyana/ Region One (Barima-Waini)/ Matthews Ridge (SYMR) – A Cessna 208B Grand Caravan (8R-GAB) made a hard landing and it was damaged. No injuries. Australia/ QLD/ Gold Coast/ Woongoolba – An Yakovlev Yak-18T plane (VH-YYZ) crashed into a paddock. One of the 2 occupants was injured. India/ Rajasthan/ Barmer district/ Chohtan area - Indian Air Force IAI Heron drone crashed. US/ IL/ Pontiac/ Pontiac Municipal Airport (KPNT) – A training Cessna 150G (N2871S) crashed on approach. No injuries. Ghana/ Accra-Kotoka Airport (ACC) – ASKY Airlines Boeing 737-43QSF cargo plane (ET-AQV) sustained substantial damage in a runway excursion on landing. The 3 crew members were injured. Russia/ Novosibirskaja oblast/ Berdsk – An ultralight trike crashed killing the pilot. US/ CA/ Jackson/ Westover Field/Amador County Airport (KJAQ) – A Cessna 180 (N2229C) crashed on landing and came to rest inverted. No injuries. Brazil/ Parana/ Santa Mônica – A Robinson R44 Raven II helicopter (PR-HPR) crashed on approach killing the pilot, injuring the passenger. The accident was caused by vulture that struck the aircraft windshield. Brazil/ Goias/ Luziania – An Embraer (Neiva) EMB-710C Carioca (PT-NAB) crashed on top of a house shortly after takeoff. The pilot and a passenger died and two others onboard were injured. Puerto Rico/ Catano – A Robinson R22 Beta helicopter crashed killing the pilot. Jordan/ Aqaba/ King Hussein International Airport – A training Diamond DA 42 airplane made a belly landing. No injuries. Bahamas/ Eleuthera/ North Eleuthera Airport (MYEH) – A Piper PA-60 Aerostar plane (N60PR) experienced an emergency gear-up landing. No injuries. US/ OR/ Prineville/ Prineville Airport (S39) – A Van's RV-9A (N8080S) impacted airport terrain shortly after takeoff and the aircraft was partially consumed by the post-impact fire. The pilot died. Indonesia/ Enarotali Airport (EWI) – A Trigana Air Service de Havilland Canada DHC-6-300 Twin Otter plane (PK-YRU) suffered a runway excursion while landing in strong winds and ran into a ditch. US/ CO/ Adams County/ E of Lochbuie/ NW of Horth Airstrip (CO77) – A Piper PA-28RT-201T Turbo Arrow IV plane (N82828) impacted open field terrain killing the pilot. Libya/ Sirte/ Abuhadi/ Qurdhabya air base - Hafter group MiG-21 fighter jet was shot down. US/ AK/ Juneau/ Juneau International Airport (PAJN) – A de Havilland Canada DHC-2 Beaver MK.1 plane (N4794C) experienced a landing gear collapse upon landing. No injuries. Venezuela/ 16,3 km from Barquisimeto – A Cessna 182R plane (YV1174) crashed killing the 2 occupants. Syria/ Aleppo/ Al-Nairab military airport – Syrian Air Force MiG-23MLD jet was destroyed at the airport by an anti-tank missile. US/ FL/ DeLand/ DeLand Municipal Airport-Sidney H Taylor Field (KDED) – A Piper PA-28R-200 Arrow (N5033S) sustained substantial damage upon landing. No injuries. Ecuador/ SW of Guayaquil/ area of Chongon – Ecuadorian Air Force HAL Dhruv training helicopter ditched in the Chongon dam reservoir. Both occupants were injured. US/ KY/ Louisville/ Louisville International Airport-Standiford Field (KSDF) – A Beechcraft F90 King Air (N98HA) made a belly landing. US/ FL/ Atlantic Ocean/ offshore of New Smyrna Beach – A Cessna 152 (N757ZM) impacted the Atlantic Ocean waters killing the pilot. Venezuela/ El Manteco/ El Medio Airstrip – A Cessna 182K Skylane (YV1625) crashed on takeoff killing the pilot. US/ KS/ Dodge City/ near Dodge City Regional Airport (KDDC) – A Cessna 210J Centurion (N3320S) impacted trees and terrain while on approach. The three occupants received minor injuries. US/ KY/ Pikeville/ Pike County Airport-Hatcher Field (KPBX) – A Van's RV-6A (N32SN) experienced a runway excursion upon landing. The airplane came to rest inverted. No injuries. Brazil/ Piaui/ Baixa Grande do Ribeiro – An agricultural Cessna A188B (PT-FFH) struck power line and crashed killing the pilot. US/ HI/ Honolulu/ Joint Base Pearl Harbor-Hickam – USAF F-22 Raptor fighter jet caught fire on landing. No injuries. Germany/ Donaueschingen-Villingen – A Piper PA-46-350P Malibu Mirage (D-EMBZ) crash-landed short of the runway. The aircraft collapsed the left hand main gear. US/ CA/ Vacaville/ Nut Tree Airport (KVCB) – A Beech B-55 Baron (N41549) made a belly landing. No injuries. Canada/ ON/ Cornwall/ near Cornwall Regional Airport (CYCC) – A Whitman Tailwind plane (C-FDLY) made an emergency landing in a field and flipped over. The pilot sustained minor injuries. Libya/ Al-Watiyah AFB area - A Schiebel Camcopter S-100 UAV used by militants was shot down. US/ FL/ Punta Gorda/ Punta Gorda Airport (KPGD) – A Piper PA-23-250 Aztec (N354TW) experienced a collapse of the landing gear upon landing. No injuries. US/ GA/ Peach County/ Fort Valley/ NE of Cameron Field Airport (GA81) – A training Luscombe 8E Silvaire Deluxe plane (N1745K) crashed on approach on Buckeye Road killing the instructor and injuring the other occupant. US/ FL/ Sebring/ Sebring Regional Airport (KSEF) – An Aero Adventure Aventura II amphibian plane (N511DS) stalled and crashed next to the runway shortly after takeoff. Both occupants died in the crash. Venezuela/ Los Roques Airport (LRV) – Chapi Air Britten-Norman BN-2A-8 Islander plane (YV2238) collapsed the right hand main landing gear on landing. US/ PA/ New Castle/ New Castle Municipal Airport (KUCP) – A Cessna 172L Skyhawk (N7079Q) experienced a runway excursion and subsequent impact with a ditch upon landing. No injuries. Australia/ QLD/ 23km NE of Roma – A Robinson R22 BETA helicopter (VH-SSD) encountered a tailwind resulting in a high rate of descent. The helicopter collided with the ground resulting in substantial damage. The pilot was uninjured. US/ TX/ Montgomery County/ east of The Woodlands – An experimental Safari aircraft (N416JB) crashed killing the pilot. US/ CA/ east of Santa Maria/ near Gifford Rancho Road – A LSA CubCrafters CC11-160 Carbon Cub SS (N232LT) force landed to brush terrain. The airplane came to rest inverted. The two occupants onboard received minor injuries. US/ HI/ Island of Molokai/ near Halawa Falls – A Cessna 172N Skyhawk (N5660E) made a hard landing due to an engine failure. One occupant is in serious condition. The other 3 occupants sustained minor injuries. US/ AZ/ Bagdad/ Bagdad Airport (E51) – An unregistered Kolb Ultrastar aircraft crashed on takeoff in gusting wind conditions. The sole pilot onboard received serious injuries. Philippines/ Tacloban Airport (TAC) – A Bombardier BD-700-1A11 Global 5000 corporate jet (RP-C9363) suffered a runway excursion during takeoff. It ran onto wet grassy terrain where the left hand main gear and nose landing gear collapsed. US/ FL/ Sebring/ Lake Jackson at Sunset Grill – A Glasair GS-2 Sportsman 2+2 plane (N7061G) flipped inverted during taxi following a landing on Lake Jackson. No injuries. US/ MI/ Holland/ West Michigan Regional Airport (KBIV) – A Cessna 172K Skyhawk (N7061G) experienced a loss of directional control and subsequent runway excursion during the landing in gusting wind conditions. The airplane came to rest inverted. The sole pilot onboard received minor injuries. Mexico/ Nuevo Leon/ General Teran - A Cessna 152 (XB-JGG) made a forced landing in a farm field and was damaged. Luxembourg/ between Schieren and Steeen – A Cessna 177B Cardinal (N34937) carried out a forced landing in a field. The plane collapsed the nose landing gear. Germany/ Rechberghausen – A Piper PA-24-260 Comanche C (D-EERZ) crashed into a garage. Both occupants onboard died. Iran/ Sarbaz city/ Kahiri region - Iranian Police helicopter made an emergency landing injuring the 4 occupants. Syria/ near the Deir-e-zor Air Base - A Ghods Mohajer-4 drone (P062A-007) was allegedly downed by ISIS members. Russia/ 45 kilometers south of Nefteyugansk – A Cessna 150 (RA-1861G) crashed injuring the 2 occupants seriously. At least 35 Syrian soldiers were killed overnight when a Syrian Air Force An-26 cargo plane (YK-AND) crashed in bad weather in the northwest of the country. The Syrian Observatory for Human Rights said the plane crashed after hitting electricity lines in heavy fog in Idlib province. But Syria's Al-Qaeda affiliate Al-Nusra Front claimed that it had shot down the aircraft. The plane was carrying troops as well as military equipment and ammunition. Сирийские крыло Аль-Каиды, Фронт Ан-Нусра сбило армейский грузовой самолет, Ан-26 (YK-AND). На борту самолета находились продовольствия и боеприпасы, которые планировали доставить в северо-западную часть страны. Сообщается, что все на борту 35 человек погибли. Инцидент произошел в районе контролируемого правительственными войсками военного аэропорта Абу-аз-Зухур (Abu Adh Dhuhur) в провинции Идлиб на северо-западе страны. Терористичната организация "Джебхат Ал Нусра", сирийският клон на "Ал Кайда", обяви, че е свалила военнотранспортен самолет, превозващ храна и муниции. Самолетът е свален през нощта при подхода му за кацане на пистата в авиобаза Абу Ад Духур в северозападната част на Сирия. Противоречиви са данните за загиналите от различните медии, но доминира информацията, че са 35 военнослужащи. Твърдението се появи на адрес от Туитър, както и на видеоклип от ЮТуб. За катастрофата се съобщава и от Сирийската организация за човешки права (SOHR), но авторите на статията считат, че причините довели до трагедията се крият в лошите метеорологични условия на полета. Тъй като фото- и видеоматериалите са изцяло на бойци от Ал-Нусра, по-убедително звучи тяхната версия. Според АSN сваленият самолет е Антонов 26 с регистрационен номер YK-AND. US/ MI/ Lowell/ South of Lowell City Airport (24C) – A training Cessna 172F Skyhawk (N7854U) impacted residential terrain injuring the pilot seriously. Brazil/ Minas Gerais/ Sao Joao del Rey Airport – A Paradise P1 ultralight aircraft (PU-AKQ) crashed on approach injuring the 2 occupants. US/ IN/ NW of Shipshewana – A training Diamond DA20-C1 Eclipse (N979DC) sustained substantial damage upon impact with structures during a force landing. No injuries. Kazakhstan/ 20 km (12.5 mls) from Shatyrkul Mine – The Olimp Air Antonov An-2 plane (UP-A0314), which set off from the northern Karaganda region en route to a remote mine, crashed in the Zhambyl region in the south at about 15:40 local time. 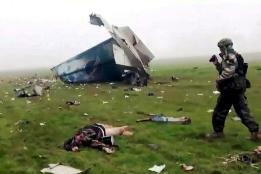 The plane was carrying 7 people, including four Kazakhmys workers and 3 crew members. Six of them died, the only survivor was a woman. Syria/ Aleppo - Syrian army shot down an unmanned spy plane belonging to the armed groups on the outskirts of Sifat town in the northeastern countryside of Aleppo. US/ CA/ near Baker/ Clark Mountain/ Mojave Nat'l Forest – A Beech 36 Bonanza (N999CJ) crashed killing the 2 occupants onboard. US/ CA/ Ramona Airport - US Army - California Army National Guard Sikorsky UH-60 Black Hawk helicopter landed on its starboard side at the airport and sustained substantial damage, during a training exercise. Both occupants sustained minor injuries. Afghanistan/ Balkh Province/ Dawlatabad District - A Britten-Norman BN-2T Islander (ZS-NAT) sustained substantial damage in a forced landing. US/ LA/ near Eunice - The unregistered Kolb Ultrastar ultralight impacted a levee. The sole pilot onboard received serious injuries. Ecuador/ Juyuintsa – A Cessna U206G (HC-BLN) was damaged when it suffered a runway excursion upon landing. Three of the 4 occupants were injured. Guatemala/ Guatemala City-La Aurora Airport (GUA/MGGT) – An Aviat A-1 Husky (TG-DRY) collapsed the left wing and left hand main gear in an accident. Russia/ Altai Republic/ Tashanta Kosh-Agach district - A Robinson R66 helicopter (RA-06205) made ​​a hard landing and caught fire. No injuries. US/ MT/ Helena/ West of Helena Regional Airport (KHLN) – A Piper PA-28-140 Cherokee (N4666R) crashed into a residential area on takeoff due to a loss of engine power. One of the two occupants onboard the aircraft sustained minor injuries. US/ KS/ Goodland/ NW of Goodland Municipal Airport (KGLD) – Following a complete loss of power to both engines, a Key Lime Air Piper PA-31-350 Navajo Chieftain freight plane (N66906) made a force landing to farmland terrain. No injuries. Angola/ Saurimo Air Base - Angola Air Force Sud Aviation/Aerospatiale SA-316B Alouette III helicopter crashed during the flying display causing injuries to the pilot and co-pilot. Canada/ 18 kilometres southeast of Key Lake – A cargo Eurocopter AS-350 B2 (C-GJPW) crashed injuring the pilot. Colombia/ Rionegro-Jose Maria Cordova International Airport (MDE/SKRG) – A Cessna 182Q Skylane II (HK-2127) flipped over and came to rest upside down during an accident. US/ AK/ Anchorage/ Lake Hood Seaplane Base (Z41) – A Cessna 170B (N2580D) experienced a loss of directional control and subsequent runway excursion during the takeoff. No injuries. US/ FL/ Lakeland/ NW of Lakeland Linder Regional Airport (KLAL) – A training Piper PA-23 Apache (N465JA) crashed into a storage warehouse. The two occupants onboard were fatally injured. US/ WA/ Everett/ Snohomish County Airport (Paine Field) (KPAE) – A Piper PA-34-200T Seneca II (N9114K) experienced an emergency landing with the nose gear retracted. No injuries. US/ CO/ Northeast Westminster – A Cessna U206G Soloy Stationair (N9957R) experienced a nose gear collapse during a force landing to open field terrain. No injuries. US/ OK/ Tulsa/ Richard Lloyd Jones Jr Airport (KRVS) – A training Cessna 152 (N6300Q) experienced a collapse of the nose gear upon landing. No injuries. US/ CA/ Twentynine Palms/ Marine Corps Air Ground Combat Center - Two Marines were killed when their Bell UH-1Y Venom helicopter crashed during a training exercise in Southern California. Italy/ Frosinone Air Base – A military TH-500B helicopter made a hard landing. No injuries. Australia/ QLD/110km north of Camooweal/ Herbertvale Cattleyard – An agricultural Robinson R22 Beta II helicopter (VH-ZBH) experienced an engine failure shortly after takeoff and crashed. No injuries. New Zealand/ Canterbury/ Timaru district/ Seadown – A training Micro Aviation B22 Bantam aircraft (ZK-SMC) crashed killing the 2 occupants. Brazil/ SP/ Jaboticabal – A Rand Robinson KR-2 ultra light aircraft (PU-CHE) crashed on takeoff. The pilot received minor injuries. US/ AZ/ Silver Springs/ near Silver Springs Airport (KSPZ) – A Cessna 150E (N4017U) impacted an airport perimeter fence during a force landing. The two occupants onboard received minor injuries. US/ HI/ Pacific Ocean west of Oahu – A Cessna 172N Skyhawk (N422BP) experienced fuel exhaustion and ditched 11 miles west of Barbers Point on the island of Oahu in Hawaii. The four occupants onboard received minor injuries. US/ HI/ Pacific Ocean 253 miles northeast of Maui – A Cirrus SR-22 (N7YT) ran out of fuel and had to ditch in the ocean. The pilot was able to deploy the aircraft’s parachute system and safely exit the aircraft into a life raft and was rescued by a passing cruise ship. US/ CO/ SE of Steamboat Springs/ near Rabbit Ears Pass – A Cessna 172F Skyhawk (N8368U) impacted mountainous terrain. The sole pilot onboard received serious injuries. US/ FL/ Fernandina Beach/ near Fernandina Beach Municipal Airport (KFHB) - A Cessna 150L (N10616) crashed on approach. The sole pilot onboard received minor injuries. Peru/ Tarapoto – A Piper PA-34 Seneca (PNP-231) landed gear up, when the nose landing gear failed to deploy before landing. Israel/ Rishon Lezion – A light plane crashed killing the 2 occupants onboard. Panama/ Marcos A. Gelabert/ airport in Albrook – A Piper PA-23-250 (HP-1159) skidded off the runway after an emergency landing. No injuries. Spain/ Albacete Air Base - Hellenic Air Force F-16D Block 50D Fighting Falcon (084) jet crashed on takeoff into other aircrafts on airbase. Both Pilots died, along with 9 French military personnel on the ground. Another 21 people were injured in the incident, of which 12 were Italian and 9 French. Damaged were 2 AMX aircrafts of the Italian Air Force, 2 Alpha Jets and 1 Mirage 2000 of the French Air Force. US/ CO/ Erie/ Erie Municipal Airport (KEIK) – A training Enstrom 280FX Shark helicopter (N86235) crashed killing the 2 occupants. US/ WA/ Kipsap County/ Hood Canal SW of Seabeck/ Guillemot Cove – An Van's RV-7 (N747BA) crashed into the waters offshore of Seabeck. The pilot is missing. US/ WI/ Hoard/ Near Center Road – A Cessna 182L Skylane (N3181R) impacted rural timbered terrain during an attempted force landing. One of the three occupants onboard was fatally injured. One occupant onboard the airplane received minor injuries and one was seriously injured. US/ CO/ SE of Fort Morgan – A Cessna 182C Skylane (N8997T) experienced a nose-gear collapse during a force landing to open field terrain. The two occupants onboard received minor injuries. Germany/ Dannenfels – A Piper PA-30-160 Twin Comanche B (D-GHFW) crashed killing the pilot. Ukraine - The Armed Forces of Ukraine destroyed one aircraft L-39, two AN-2, one Yak-52, two Yak-50 and four Mi-24 helicopters. Italy/ Lombardy/ Milan/ Milano-Linate Airport (LIML) – A Piper PA-46-350P Malibu Mirage/JetProp DLX (N369ST) made a belly landing. No injuries. US/ CA/ San Diego/El Cajon/ Gillespie Field Airport (KSEE) – A Ryan Navion B (N567K) experienced a collapse of the nose gear upon landing. No injuries. Ecuador/ Tena - A military HAL Dhruv helicopter (FAE-605) of the Ecuador Air Force was damaged in an accident. The 4 occupants were injured. Nigeria/ Borno State/ Dumge village – A CASC Rainbow CH-3 drone crashed. India/ Rajasthan/ Barmer - Indian Air Force MiG-27 jet crashed. The pilot ejected. One person on the ground, a biker, was injured by the debris of the plane. Australia/ NSW/ north of Wollongong/ Between Bulli Tops and Sublime Point – A Conroy Aviation Sparrow aircraft (19-7975) crashed killing the pilot. Spain/ 20 mi W of Marbella/ Gaucin - A MBB Bo 105 helicopter carrying drugs struck power lines and crashed. Both occupants died. Vietnam/ Ho Chi Minh City/ Cu Chi District - Vietnam Army Aviation Bell UH-1H Iroquois helicopter (7912) crashed a few minutes after takeoff. The 4 occupants onboard died. Among the victims is Lieutenant Colonel Tran Van Duc, flight head of the Air Force Regiment 917. US/ MO/ Chariton County/ SE of Rothville – A Cessna 310 (N131X) experienced a gear-up force landing to a field. No injuries. US/ OK/ Kingston/ near Alberta Creek Marina/ Lake Texoma – A Van's RV-9A plane (N708JE) impacted the waters of Lake Texoma. The pilot is missing. US/ FL/ West Palm Beach/ Palm Beach County Park/Lantana Airport (KLNA) – An airplane and a helicopter experienced a midair collision. The Piper PA-28R-200 Arrow II plane (N54380) sustained minor damage and the Robinson R22 Beta helicopter (N475AT) sustained substantial damage. No injuries. Brazil/ Roraima/ farm in Monte Cristo – A light plane struck power lines and crashed while tried to land. Both occupants were seriously injured. Syria/ southern Damascus province/ near Bir Qasab - Syrian Air Force MiG-23 jet was shot down by insurgents. The pilot apparently died in the crash. Netherlands Antilles/ 15 mi off Boca Druif/ Aruba – A Dinama Aircorp Canadair CL-600-2A12 Challenger 601 (N214FW) was shot down by the Venezuelan Air Force over open waters. Three bodies and 400 packets of drugs have been found. Libya/ Tripoli-Mitiga International Airport (MJI) - Libyan Air Cargo Ilyushin 76T cargo plane parked on the apron was consumed by fire. Switzerland/ Bernex – A Piper PA-46-350P Malibu Mirage crashed killing the pilot. India/ Gujarat/ Jamnagar - Indian Air Force MiG-21 fighter jet crashed. The pilot ejected safely. Philippines/ Nasugbu in Nasugbo/ 300 meters off the shoreline of Barangay Bucana – Philippine Air Force SIAI Marchetti SF.260FH training plane (1034) crashed into the sea, while flying a 3-aircraft formation training mission. The PAF confirmed the death of a pilot instructor and a cadet pilot. US/ AK/ Wasilla/ SW of Wasilla Airport (PAWS) - Two planes, Piper PA-18 Super Cub and an unidentified aircraft, collided in flight in Alaska’s Mat-Su Valley, southwest of Wasilla, with two people injured. Yemen/ Dhamar province/ South Sanaa - US Army UAV crashed. Paraguay/ Ypacarai Lake – An ultralight aircraft (ZP-UX004) crashed into the lake Ypacarai. No injuries. US/ TX/ Calhoun County/ Seadrift – A RotorWay Exec 162F experimental helicopter (N162RB) experienced a hard landing. No injuries. US/ AK/ Palmer/ Palmer Golf Course – A training Piper PA-12 Super Cruiser (N2370M) clipped power lines during a force landing to the Palmer Golf Course. No injuries. US/ FL/ Bushnell – An Evolution REVO aircraft (N40EV) experienced a bounced landing and came to rest inverted. The passenger onboard the trike was seriously injured and the pilot received minor injuries.